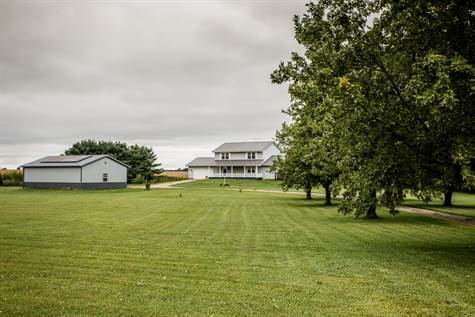 Welcome to this spacious country home on 5 acres. The home offers a 25 x 28 family room with a direct vent gas log fireplace and its own heating and cooling open to the kitchen with eating area and formal living room with a gas fireplace, it also offers a full bath and laundry room on the main level, upstairs you have 3 spacious bedrooms and a full bath with option and space for another full bath in the master bedroom, it also offers a partial basement, screened in back porch, a 30 x 40 detached garage with electric and 8' doors and a fenced back pasture. Along with geothermal heat, 16 solar panels, replacement windows, owned water softener and a metal roof on the house and the detached garage, and a tree lined drive. Come check out all the possibilities.